Fourteen people were killed in Udhampur district in Jammu and Kashmir when a mini bus fell into a gorge on Tuesday morning. 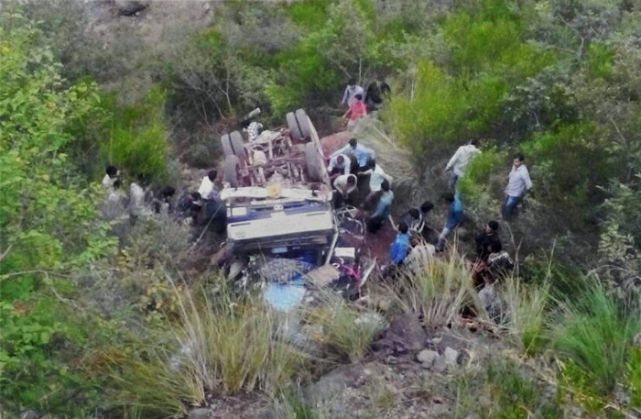 The passengers were on their way from Ghordi village to Ramnagar town when the accident took place. "A mini bus on its way from Ghodi to Tehsil Ramnagar of Udhampur skidded off the road near Dalsar at 0845 hours and plunged into a deep gorge when the driver failed to negotiate a sharp turn," a police spokesperson was quoted in the local daily, Daily Excelsior. Deputy Commissioner of Udhampur, Dr Shahid Iqbal Choudhary said, "At least 14 people are feared dead so far and the toll may go up." Eight men, five women and a child were killed in the accident. Ten seriously injured passengers have been taken to the Government Medical College in Jammu, police said.